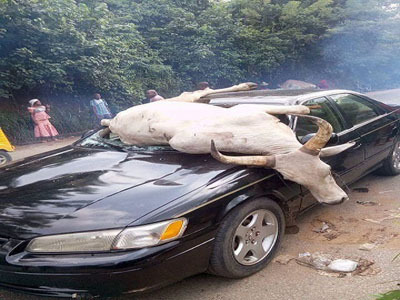 Four members of a family resident in Aba, the commercial nerve of Abia State have reportedly escaped death by the whiskers as a cow believed to have strayed away from a herd rammed into their moving vehicle, smashing his car windscreen. The incident, The Nation gathered happened along the road leading to 7-Up Breweries, off Ogbor Hill. Sources within the area where the incident happened said that occupants of the vehicle, a Toyota Camry,were unhurt except that their car’s windscreen was badly damaged. They said that the cow believed to have strayed away from a herd of cow around the area suddenly emerged from a nearby bush and jumped unto the Camry heading into Aba, the heart of the commercial city. “We came to clean our vehicles at the car wash; nobody knew where the cow emerged from. We only heard a bang when it (the cow) crashed into the car which was approaching the junction to head into town. The woman and her husband were trapped, we managed to rescue them unhurt,” eyewitnesses narrated.